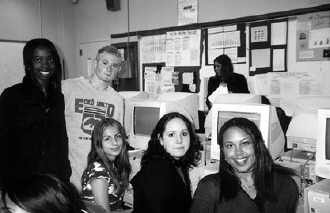 May 24, 2001 - Using state-of-the-art computer technology and Internet up-links with satellite-generated data, students at Bayside High School have been participating in Signals of Spring, a NASA-sponsored program. Designed by Glen Schuster, the project director, the one-semester course is centered on the utilization of computerized satellite imagery and other Internet-based data to track migrating land and marine animals. Stephen Berman, assistant principal for science at Bayside High School, made the initial contact with NASA to establish the program’s use at his school. Instead of memorizing facts from lectures and textbooks, students participating in the Signals of Spring program logged on to its Web site (www.signalsofspring.com) each day to link up to real-time data transmitted via satellite. Science teacher Adrienne Gappelberg, whose Signals of Spring class has juniors and seniors, as well as a few sophomores, said that prerequisites for the course were earth science and biology. Some of the students are novices to computers, while others are more experienced. Students teamed up to track the spring migration of one of several species of birds. They analyzed maps showing the birds’ daily location, weather conditions, wind patterns and even the distribution of vegetation on the land. The program combines the curriculum areas of math, life science, earth science, technology and geography. According to Schuster, who is a meteorologist and a math and science teacher in New Jersey, the program uses interactive learning to meet requirements of the new educational standards. Students were expected to use current data from satellites to observe all aspects of a bird’s migratory path and then to make inferences about how and why a bird travels in a certain direction. Birds are tagged with transmitters that enable satellite tracking of their movement. Students at Bayside studied the migration of sand hill cranes, osprey and red-tailed hawks. They also looked at satellite-generated maps of seasonal and daily weather changes, topography, vegetation growth and geography. After making observations, they logged their analyses on the program’s Web site. According to Bayside student entries on the Signals of Spring Web site, as of April 20th, “Snoopy” the osprey, who winters in Florida, was well-established at his northern New Jersey nesting grounds. One student team studied “Sylvester,” the sand hill crane, who chose not to move from a 19-mile area surrounding his Texas winter home. The students speculated that changing wind directions and heavy cloud cover delayed “Sylvester’s” migration. The Bayside High School students made predictions and drew conclusions based on satellite-generated maps and charts from a multitude of links to the Web site. Their journal entries are posted on the site so that students from other schools can compare notes and share information. The two classes also generated their own graphs, maps and charts to illustrate changes in weather, climate and wildlife habitat. Students were enthusiastic about the course and excited to show the results of their work. “It was great, lot’s of fun,” students Lareesha West and Simone Lawson both said. Gappelberg said that the classes actually spent only about a month using the specific curriculum, Signals of Spring. Then, she guided the students in using what they learned to research and write about various endangered species. The group recently took a trip to the Bronx Zoo to see first hand what sand hill cranes, ospreys and red-tailed hawks look like. Schuster said that of the more than 100 schools currently using the program, Bayside is utilizing the course to its fullest potential. Berman said that the students are in the computer lab every day. There is a computer for each student in the class. Other Queens schools that are trying Signals of Spring this year are Jamaica High School, John Adams in Ozone Park, Springfield Gardens and Forest Hills High Schools. Designed to be used by students in grades 7 through 12, I.S. 238 in Hollis and I.S. 59 in Springfield Gardens are also experimenting with the satellite-generated program. Bayside science teachers, Gappelberg and Daniel Vincent, participated in a three-day training session last fall. It was included in NASA funding of the project. NASA initially funded Signals of Spring for three years, but that will end in June 2002. Schuster, president of U.S. Satellite, Inc., of Tarrytown, the company that coordinates the program with NASA, said that any New York City school was allowed to use the program for free. However, after next year, unless he receives more funding, Schuster will be charging for the program.